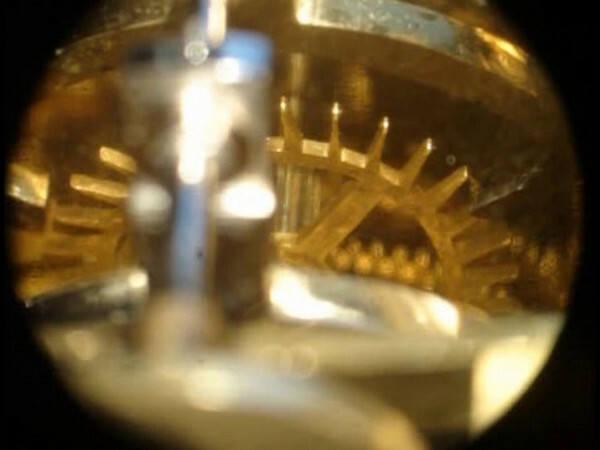 This video of the escapement was shot through a 6 power microscope with a Sony DSC-T200 camera. Note, what you are seeing is a reflection of the mechanism off of the back of the front plate of the mechanism - I couldn't shoot the escapement directly. I always test my escapement work by running with no pendulum, hence the rapid beat, and I also grease the pallets, which makes it even more important that the escapement be perfect.